In the last few years, our family has visited a number of children’s museums around the country. Generally speaking, you can’t go wrong, but The Magic House: St. Louis Children’s Museum stands out. Boasting 55,000 square feet of play-based learning, The Magic House ranks among the city’s top attractions for families. Here’s the thing about the Magic House: it is huge. It is housed in a Victorian house that has been expanded on both sides, so there are two wings, each two stories plus a basement, plus the original house, which has a third level as well. A sports training room where kids can try on football gear and test their strength and balance like college athletes. “Recollections,” where a motion detector and a big wall allow you to make rainbow-colored art simply by moving your body (my daughter’s favorite). Magnetic shavings choreographed to music and a “musical chairs” where simply sitting down and standing up turns on and off different sections of an orchestra. “Wonder Works,” an extensive STEM area aimed at the younger set. A three-story slide, climbable “beanstalk.” There’s an outdoor play garden. 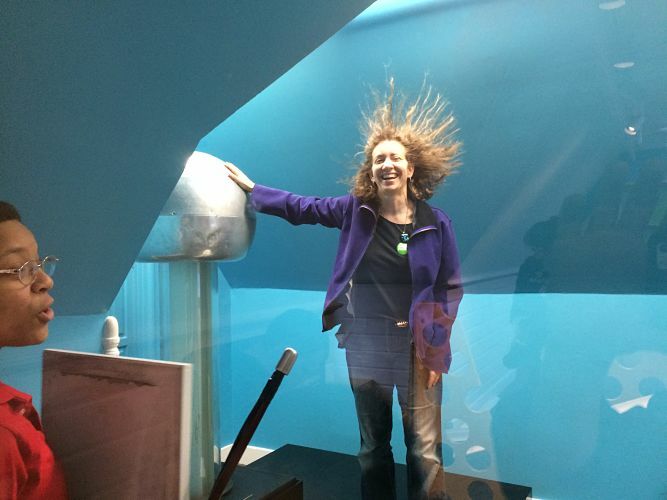 The electrostatic generator, where you can make your hair stand on end—a Magic House classic. One particularly notable area is the “Star Spangled Center.” Here, you will find a mock-up of the Oval Office, with a replica of the Resolute Desk. Kids can pretend to be the President and learn trivia about presidents present and past by looking inside the drawers or picking up the desk phone and dialing. My 8-year-old loved standing at the podium and reading portions of presidential speeches to a closed-circuit TV. The above barely scratches the surface, so it probably won’t be a surprise to hear that this place is crowded—all the time. Be prepared for it. The attendant at the admission desk told me most days there’s already a line when the doors open. The quietest time of the week is Friday evening, when the Magic House stays open until 9 p.m. This was when we visited, and it was pleasant and relaxing. The space, however, was clearly designed to accommodate many more people than were there that night. In my opinion, the Magic House is ideal for kids between 3 and 10. Our 11-year-old enjoyed himself, but he would have been ready to go long before his younger siblings. The museum offers special programming for preschool and elementary kids, and that is the age range that will enjoy it most. Plan to spend at least 3-5 hours, and allow most of the day if you can. Make sure you have enough adults for the number of kids you’re bringing, and set up a meeting place in case someone gets lost. It’s a quirky building with a lot of nooks and crannies. Although it is fully accessible, it’s technically two additions connected to the main house only on certain levels, so you have to go up and down quite a bit to see everything there is to see. Take advantage of the “calming corner” in the lower level. This is a space set up for nursing mothers and families with kids who need a break from the stimulation. It’s set up with quiet activities to keep littles busy while Mom nurses. Food is available at the Picnic Basket Cafe, offering sandwiches and salads for $6.75 and snacks and drinks for a couple dollars. The museum store offers toys–good ones! The closest thing I saw to the usual commercial fare was a Batman spy kit. Otherwise, expect to find really good, brain-building, mostly non-electronic playthings. The Magic House is at 516 S. Kirkwood Road in St. Louis, Missouri. Directions and public transit info are available here. Parking is free on site; when school is not in session, overflow parking can be found at a nearby school and church. Hours vary seasonally, but the website posts the current week’s schedule. Admission is $11 for everyone over the age of one. The Magic House also offers membership options, starting as low as $25 for one child or $80 for a “value” membership that covers weekdays only. 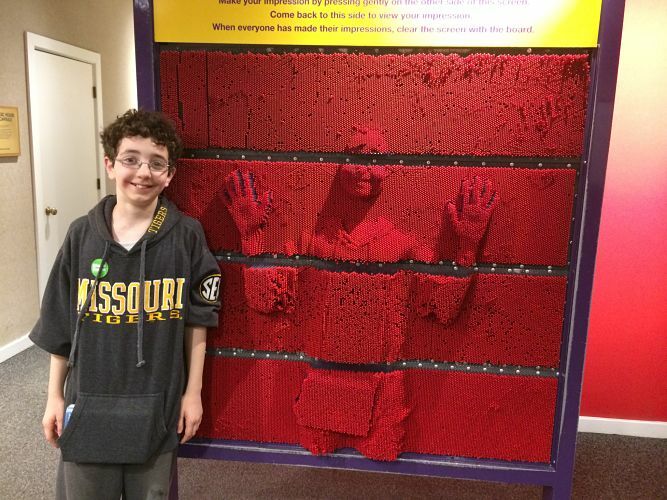 Our family visited the Magic House as guests of Explore St. Louis, in exchange for an honest review.